Motorcycle Daily doesn’t necessarily think it’s such a great idea to take phone calls or engage in other distractions while riding a motorcycle, but understands our readers are out of diapers and able to make their own decisions. You can’t escape it—with so many ways to communicate, privacy is becoming a rare commodity. You are expected to be reachable 24 hours a day, seven days a week, with folks calling, texting, Tweeting, emailing, Facebook-ing and expecting you to be responsive to all of it. How do you hide from it all? Well, you could practice law or medicine, which apparently excuses you from the need to answer the phone ever again, or you could just leave your helmet on prominent display on your desk—nobody expects you to take a call on your bike…or do they? 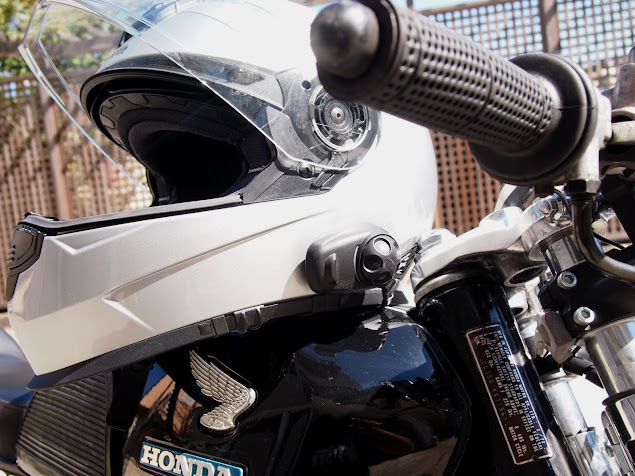 Since roughly 2006, Bluetooth headsets for motorcycles have been around, and though the early models left much to be desired, the second generation of headsets is much better. 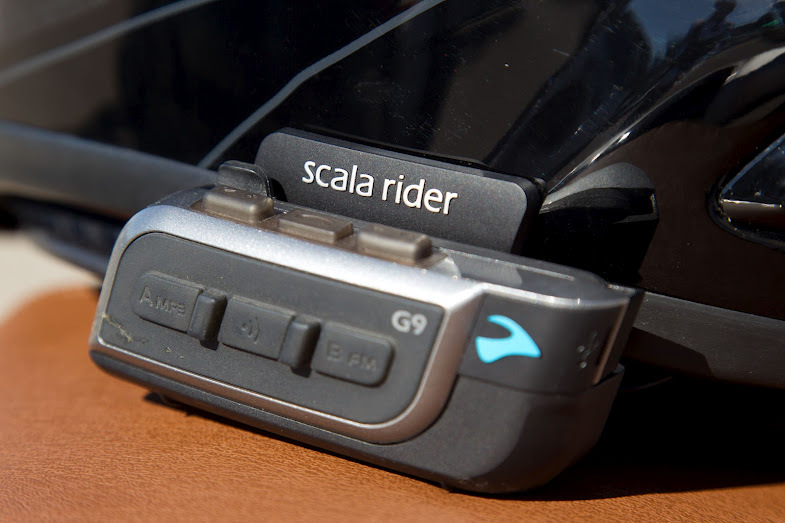 The Cardo Systems Scala Rider G4 I tested last year changed all that—it was the first self-contained BT headset I tested that was actually functional at freeway speeds on an unfaired motorcycle. That’s the litmus test for me, because if you can’t wear earplugs and hear crisp, clear audio at 75-plus miles per hour, what’s the point of wearing a headset? Well, here are two headsets that can deliver that kind of performance, so when the non-motorcycling population starts seeing the majority of motorcycle riders wearing them, you can forget about using your helmet as a refuge from the constant storm of electronic media. Oh well, at least you’ll still be able to ride. It’s not just your boss or your kids you’re trying to escape—sometimes it is your spouse/significant other. That escape was a motorcycle ride, but many riders will give up this solitude voluntarily thanks to the quality of the latest devices. Scala’s G4 and G9 headsets (as well as other brands of headset) are devilishly well designed for person-to-person as well as group communications. The G4 was already very good for groups, but the G9 is even better. That’s thanks to a few innovations on the G9. 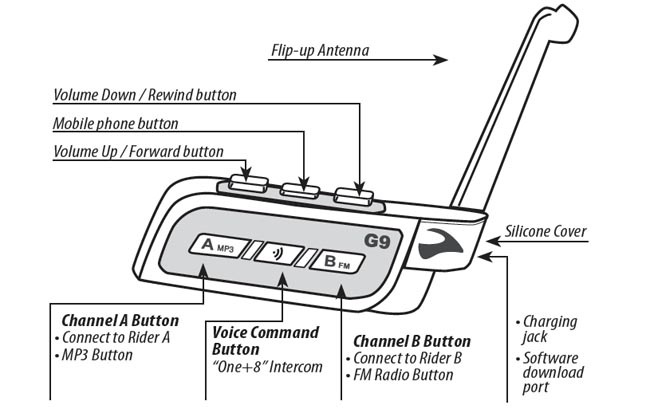 Like the G4, the G9 allows a simultaneous conversation with three other riders, using very good voice-activation technology and outstanding speakers to minimize the “whats?” and “say agains?” But the G9 adds the “One + 8” feature, which lets the user pair with up to eight other Scala-equipped riders (even those with older Scala models) and then use the Voice Command feature to call that specific rider by name. The intercom’s claimed max range is a mile—since some comments on my last Cardo story wanted to know how far it really worked, I did some testing. I found that yes, indeed, in optimal conditions—line of sight in good weather—the range seems like it’s about a mile, but unless you’re riding somewhere with flat, straight roads, you can lose contact in just a few turns on a twisty road or a block or two in the urban office-tower canyons. Another innovation the G9 offers is a social-networking aspect. When a user logs in to the Cardo Community website and his headset is plugged into his computer, the site detects the headset and displays its settings—VOX sensitivity, FM radio presets, etc. It also shows a buddy list of the paired riders associated with that headset, and there’s even a function to look up users the rider may know to add to the buddy list. It’s like Facebook for your headset. Pairing is now simpler with the G9. To link two G9 headsets, you just put the headsets in standby mode and then have them gently nasty-dance together—they pair automatically. If your buddy list is full, the buddy you haven’t spoken to for the longest time will be bumped off (you probably didn’t like riding with him much anyway). You identify your buddies by the names they have chosen for themselves, and you can scroll through the list of paired buddies. Sounds easy, but in practice you should have the manual handy (I keep mine in PDF format on my smart phone) and be ready for some frustration, as the Scala headsets we’ve used seem a little quirky, sometimes refusing to pair when you want them to and then pairing suddenly while you’re riding. I’m sure we just need more practice, or maybe our headsets are just Romeo-and-Juliet types that don’t like be told when and where to pair up. In use, it’s a hell of a thing. There they are in your ears, your riding buddies, and if you’ve been riding with them for a while, you can now talk to them whenever you want. And you can’t ignore them, because it’s rude. The only thing you can do is go faster so you get out of their line of sight, but that means you can only ride with those slower than you, or you will be trapped listening to stories about their kids, theories about the Trilateral Commission, complaints about various ethnic groups, etc.. And if you’re used to communicating with your lovely wife or wonderful husband with just the occasional disinterested exchange in the kitchen, let’s just say you should start saving for the divorce attorney now. Just in case. That’s because, like the G4, audio quality on the G9 is very good, maybe too good. Both the microphone and speakers work just as advertised, if you install and use them correctly. A speed-sensitive audio booster kicks in and makes music, podcasts or Ned’s description of the 23-pound bass he caught in 1987 resound in your skull with perfect clarity, even through earplugs. I frequently find I’m having phone conversations and the other conversant has no idea I’m riding a motorcycle, and I’m also impressed with the reception, ease of use and decent sound from the FM radio. The rechargeable (from a USB port, easy to rig up with your bike’s 12v system) lithium battery gives seven days of standby time, 13 hours of talk time and charges in a few hours. It works with any Bluetooth 2.1 device including radar detectors, GPS units and smartphones. You can also swap the boom mike for a plug-in mike on the G9, to work better with full-face helmets with close-fitting chinbars. The G9 is a great product that does everything Cardo claims. If the price seems steep, you can opt for just a single headset for $289. Looking for a lower-priced alternative? I’ve also been testing Sena’s $129 SMH5. This may be perfect if you don’t like talking to your buddies so much. It’s intended as a simpler, lower-priced addition to Sena’s line of BT headsets, along with the $219 SMH10. It’s a very functional device that’s very easy to use. The SMH5 is noticeably smaller and lighter than the SMH10, but shares most of its features. The main unit weighs about the same as the clamp, less than 3 ounces together—it’s hard to notice the additional weight on your head. It also installs easily, either to a clamp or a stick-on mount. The mic and headphones Velcro into your helmet and plug into the main unit with a mini USB connector. Easy to pop on, but it can pop off with the mistaken brush of a glove or bump against your messenger bag or backpack strap. Like the 10, it’s controlled with an easy-to-manipulate jog wheel, rather than the fussy little press-and-hold buttons on the Scala. You can also use it as an intercom with another rider (or your passenger), up to 400 meters line-of-sight. What it doesn’t offer you may not care about. No FM radio (which has sucked since the ’80s anyway, am I right, ladies? ), no three or four-way conferencing with other riders, and you can’t do a 3-way phone conference between you, the caller and your passenger. The battery is also smaller than the one in the SMH10—8 hours of talk time and 7 days of standby instead of 12 and 10 respectively. Don’t chat with others on the road? Just need something to stream your audio source, make phone calls with or talk to your passenger? The 5 may be all you need. 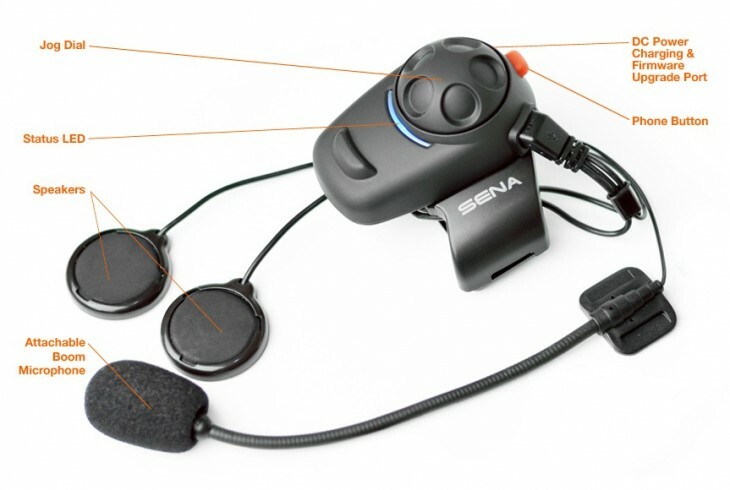 It also doesn’t offer the multiple-device and stream-to-passenger functionality of the Cardo and the SMH10, but Sena does offer this cool SM10 dual-stream BT stereo transmitter that lets you connect multiple devices (either by hardwire or BT) and then stream their signal to your passenger’s paired headset. On the road, you’ll probably be pleased with the SMH5’s functionality. Audio quality is good, and it’s very easy to use. Tap the jog dial in and it plays, tap it again and it pauses. Rotate it forward to turn up the volume, rotate it back to turn it down, press and rotate to skip through music tracks (if your audio device uses the A2DP and AVRCP profiles, which most modern phones and other BT devices do). It’s actually a little too sensitive—easy to accidentally bump it off or on with your glove as you lift your faceshield or adjust your helmet. As I said earlier, battery life is a little short—you should charge it before every ride—but unlike the Scala, you can actually recharge while you’re riding with the USB cable and one of those 99 cent cigarette-lighter USB chargers (not included). Not such a high price to pay for the feathery weight. You can select either a boom or wired mike, depending on your helmet type. About that audio quality. It’s good, but not loud. The SMH5 is equipped with an ambient-noise-sensitive audio booster, but if you’re wearing earplugs (which you should do if you’re traveling over 50 mph, regardless of what kind of helmet you have or bike you’re riding to prevent permanent hearing loss) you may have trouble hearing the audio signal clearly at speed. That’s in the most extreme circumstances—at high speeds, with earplugs in, listening to speech (like a podcast or a phone call) on a naked bike. One of Sena’s engineers, Dan Kim, spoke to me about this and told me Sena makes it as loud as it can without risking hearing loss. Translation: they don’t want Lenny Litigious suing them after going deaf from listening to his headset without earplugs. Kim suggested the accessory larger speakers ($25), so I installed a pair, but even though it improved the sound quality, especially bass, and it did set the speaker better against my ear (which helps), it was still just a touch too quiet, particularly in high winds. Lawyers! Still, if you don’t wear earplugs (a self-correcting problem, if you think about it, as you won’t need them after the years of wind blast make you deaf as a box of gravel) or have a big windscreen on your ride, the Sena SMH5 is a really great product. I’ve seen it advertised online at under $100, and it’s a well-designed and high-functioning little unit that doesn’t feel budget at all. I’m impressed with how well both of these products function and look forward to the third wave of BT headsets for motorcyclists, but I’ll occasionally miss the rapidly ending era of solitude within one’s helmet. I couldn’t care less about these intercom/telephone things. But I was hoping to get a better look at the motorcycle in the lead photo. Why don’t you do a write up on that thing. Hang up and ride. Disengaged driving has no place on our roads. Yes, we heard you the first time. IMO – The popularity of any given system is price derived. The Sena SMH-5 units are the lowest priced units available – right now. At around $100 (each, $200/pair) they seem to be selling well. The Interphone has been around for a couple of years, but it is still double the price. There seems to be 2 types of buyers – Those looking for the lowest cost/simplest systems to use, and those for whom price is of minimal concern, but they want every single feature available, and technological complexity is of no concern. I just spent a week using the SMH5 (easily installed on two Nolan N-103s)and what they excel at is rider to passenger communication. Easy to use, loud enough, and quick to recharge, they were terrific. I have been using G9 and it works great for me. At first I was having a problem since I am the type of person who doesn’t want to read and master manuals. But with a friend who taught me how to I was amazed with its functionality its really perfect for busy riders out there!Glad I bought! I tried the Blue Ant F4 when it was brand new…it was 75% of the way there–I couldn’t get it to work right at high speeds. Riding my motorcycle is kind of like my last opportunity in my life to escape all the connectivity. While I recognize this may be great technology, I wouldn’t use one if you gave it to me……. My wife and I have a G9 Powerset and they work great. Like was mentioned in the story, I have taken phone calls on the hiway and the person I was talking to had no idea I was on my bike. I commute daily to work and having traffic radio, along with regular radio or my music( which I can pause or skip though if I want a different tune) is real nice. And we have even found they seem to work better if you are wearing ear plugs, cuts out all the wind noise and helmet rattle and leaves a much clearer sound. While Sena loses a competitive advantage in regards to speaker volume, it regains some of it with the earphone baseplate. Hang up and ride. There is no place on the road for distracted driving and a motorcycle will always come up second best in any collision. All those cars drifting around and appearing drunk? Many of them are visiting on their cell phones. We may be adults but sometimes we need somebody to help us make better decisions. Too many of us learn the hard way. I have a Blinc 2, and it works great. My only complaint is that not a single one of my helmets has truly enough room for the speakers. A few hours on the bike and I literally have bruises on my ears. I’ve seen a few helmets with special recesses built in for speakers, but they’re few and far between. I wish more helmet manufacturers would design helmet with that in mind. If you’re buying one of these units I suggest you check your helmet before purchase, to make sure there is room for the speaker. It’s a special helmet for people with jutting chins, like Jay Leno! I guess you guys missed the fact that the Interphone F4, which has been available for more than 2 years works perfectly well at speeds in excess of 75 mph with ear plugs.